Naomi Warin in Editor's Picks World Affairs on 13 November, 2016. Civil service in remembrance of November 2015 victims as dozens gather to mourn at Place de la République. Today marks one year since the Paris terror attacks, when Daesh operatives killed 130 people in coordinated strikes across the city. Paris, so often associated with love, culture and gastronomy, became the setting for an atrocity, a massacre. Countless personal tragedies played out that night, and thousands of lives were changed forever. Even today, it is reported that 20 victims are in-patients in Parisian hospitals, while 600 others continue treatment as out-patients and a further 2,000 receive ongoing trauma counselling. People often say “don’t let the terrorists win” but, for some, the physical and psychological scars of the attacks may never be erased. For me, too, the Paris attacks were a life-changing event. Like many others in the city that night, while I was not a direct victim of the violence, my worldview was altered forever. My year abroad turned quickly from dream to nightmare as the terrible events of Friday 13th November unfolded. A few days later, I wrote an article about my experience of the night itself and the tension in the days that followed. Reading that article now, the feelings of shock, horror and confusion wash over me once more, and I am taken back to a place in which nowhere seemed safe, no one seemed trustworthy and no one seemed to understand. Of course I, like many others, healed over time. Returning to Paris after Christmas felt like a fresh start – I fell in love with the city again and made the most of all it had to offer. Gradually, the fear faded. I no longer thought twice about going out to a bar with my friends and, outwardly at least, life returned to normal. All around me too, Parisians were getting on with their lives. I vividly remember one night, a few weeks after the attacks, finding myself outside one of the bars which had been targeted. This place, so recently a scene of death and violence, was once more full of people, full of chatter, full of life. I saw the bar as a symbol of recovery for a city and its people. That is not to say that Paris has returned to its pre-attack state. The night of the attacks constitutes a traumatic point of rupture in Parisian mentality. There is a before, and there is an after. Although life continues, looking much as it did before, there is a new fear, a new caution, an expectation of more to come. Not only did general impressions of the city change – so much so that I have heard it described as “dangerous” on more than one occasion – our mental geographies changed too. Areas that have previously been thought of as vibrant, young and carefree became associated with unspeakable violence, tragedy and terror. By hitting busy bars, restaurants, the national stadium and the Bataclan music hall, the terrorists left behind not only death and physical injuries, but also a universal fear that “it could have been me.” Subsequent attacks in Rouen and Nice have served only to heighten this concern. As a nation, France is deeply traumatised. Since the attacks, the country has remained under a state of emergency, with an extension agreed until the end of January 2017. Consequently, around 100,000 security forces patrol the streets of major cities and, in Paris at least, it is now commonplace to have your bag searched before entering a shop or museum. Police also have extra powers to carry out searches and place people under house arrest, something which has caused organisations such as Amnesty International and Human Rights Watch to express concern over a decline in civil liberties. Moreover, many worry that Muslim immigrants pay the ultimate price for the attacks, as they come under suspicion due to their race and religion. Some far-right politicians have even suggested opening a Guantanamo Bay-style prison in which to incarcerate suspected terrorists. With Marine Le Pen’s far-right Front National party on the rise, France has much to fear for the future. 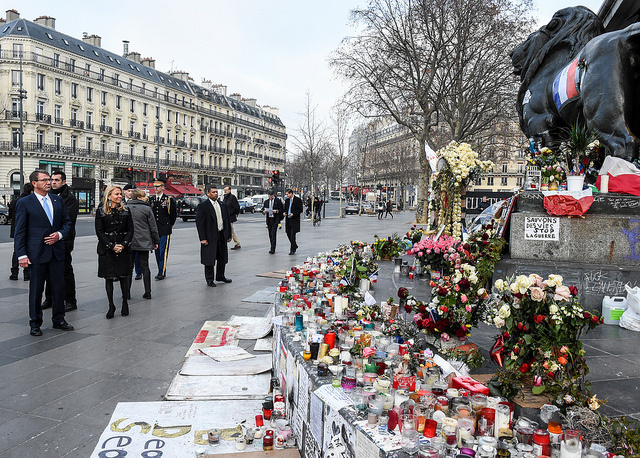 The massive memorial in Place de la République remained in place for many months after the attacks. The statue of Marianne embodies the national motto of France: Liberté, égalité, fraternité. So, for many, life goes on, but it is different to before. A poignant series by photographer Jerome Delay shows how the scene of one of the most heart-wrenching photographs of the attacks is now bustling with everyday life. Equally, in August, the huge memorial to the victims at Place de la République was taken down, with the graffiti cleaned off the Marianne statue, a national symbol of France. Archivists transferred many of the items left at the memorial to the city’s archives, consigning them to history. Yesterday evening, the Bataclan theatre reopened with a concert by British singer, Sting. Security was tight and tensions were high, but Jules Frutos, who has co-run the venue for 12 years, was adamant that the music hall should return to its original purpose: “We had to go on after such horror and not leave a mausoleum, a tomb.” These symbolic events demonstrate that the people of Paris are determined to move forward, rather than remain paralysed by the attacks that took place. Today, however, people will stop and remember. On this anniversary, the Bataclan is closed, left in respectful darkness and silence, peacefulness being the chosen tribute to those who lost their lives there one year ago, and to those whose lives will never be the same again.